Walking, whether rambling or hiking in the countryside, or the unplanned urban exploration of a would-be flâneur’s dérive – call it what you will – seems to be the hippest new literary genre. Often found cosily in tandem with what can only be described as ‘the new nature writing’, the genre undoubtedly has its stars. High in that firmament is Robert Macfarlane. Almost everywhere you look in the literate media these days, Macfarlane’s name seems to crop up. As well it might, as his new book The Old Ways has instantly and deservedly become a best seller. Having already been lauded in features in the Guardian and suchlike, The Big Issue has this week also seized the opportunity to echo the zeitgeist and published a feature on Macfarlane taking a walk in the company of fellow writer and bipedalism enthusiast, the sardonic (and sesquipedalian) pavement-plodder Will Self. The desired result: an interesting combination of styles and focii in which rural meets urban, wild nature confronts man-tamed landscape, and literary topography melds with psychogeography. Given such a brief, it seems almost odd that the Psychogeographer General, Iain Sinclair, landscape ombudsman extraordinaire, wasn’t invited along for the stroll. There again, three is a crowd, and Sinclair was no doubt already busy enough with the Sisyphean task of hurling word-bombs of withering allusive prose at the perimeter fence of the Stratford 2012 Olympics site. The Big Issue walk – delightfully, if almost predictably – took place along the crumbling Suffolk coast, the mysterious region between Bawdsey and Orford Ness, a coastline rich with legend and secret histories: a luminous landscape of shingle, rare birds and nuclear power stations where the mud itself murmurs of UFO sightings, secret weapons testing, silted estuaries, lost ports and sea-claimed monasteries – the most distinctly ‘Here be Dragons’ patch on the East Anglian map. 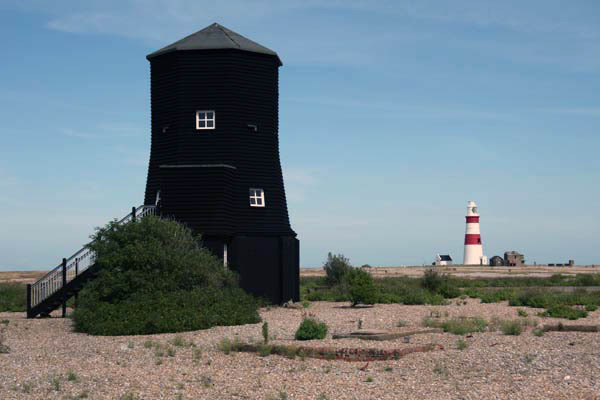 Pleasingly, the Will and Rob walk also took in some of the territory I have described in my own humble walking guide to the Suffolk coast: Suffolk Coast and Heaths: Three Long-distance Walks in the AONB, available from all good book shops and even a few bad ones. 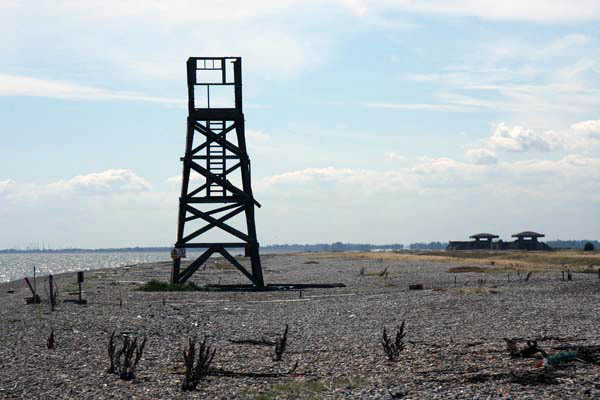 If you are not at Orford Quay for sailing, your eyes will no doubt be drawn across the water to Orford Ness, which exudes an air of mystery typical of places associated with forbidden territory. From 1913 to the mid 1980s, the spit was firmly closed to the public, a top secret, no-go area dedicated to military testing and radar research. 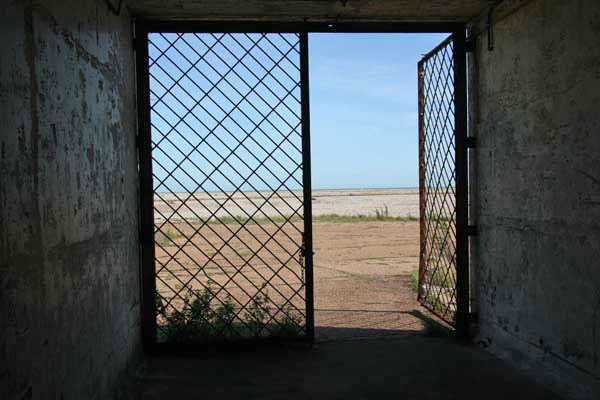 The links with its secret past are part of its appeal; otherwise, it’s undeniable that Orford Ness is quite a remarkable bit of geography. Though hardly pretty, this long shingle spit is undoubtedly evocative. 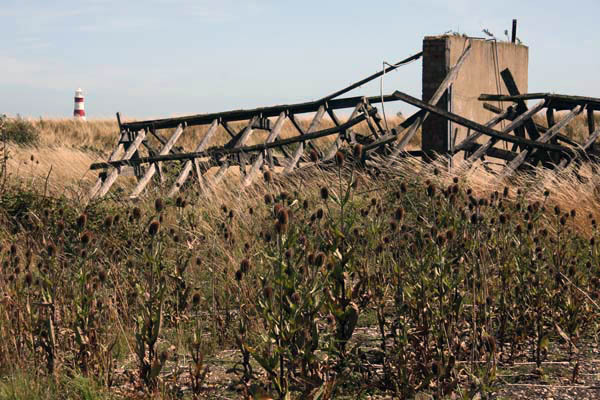 Signs warn about unexploded ordinance, and everywhere you’ll see tangles of tortured metal and wire netting among the teasels in the shingle. Overall, it’s a rather melancholy landscape and you might begin to wonder if Orford Ness should actually be ‘orfordness’, a state of mind, rather than the name of a wayward landform. 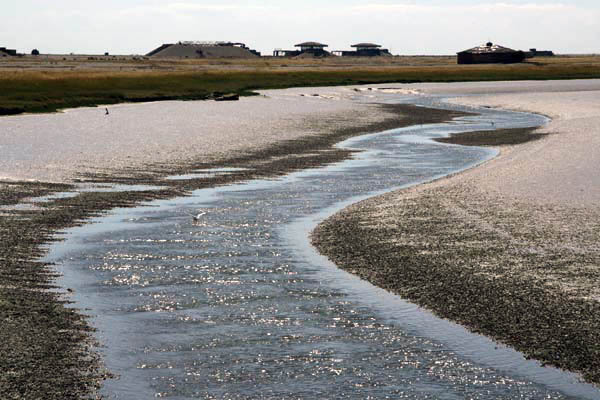 Seen from Orford Quay, Orford Ness has the appearance of being an island, and the ferry trip across the River Ore simply adds to this impression, but it’s not – it’s actually a long sand spit that begins just south of Aldeburgh and gradually widens as it follows the coast south. It is the largest shingle spit in England (nearly ten miles long) and it is only when you disembark at the jetty that you can really appreciate the scale of the place. The National Trust has a number of recommended way-marked routes to follow but the reality is that you won’t see much unless you are prepared to walk some distance. Concrete roads lead around the spit and you have to trudge along these some way before you get to see anything of much interest. Bicycles are not permitted. This entry was posted in Literature, Suffolk, Walking and tagged Iain Sinclair, Orford Ness, psychogeography, Robert Macfarlane, Slow Norfolk & Suffolk, Suffolk, Suffolk Coast Path, The Big Issue, Will Self. Bookmark the permalink. Love that place, we went camping near there at Easter in the rain and wind, such a strange soggy landscape with a fascinating history! I went a few years ago, a stop off on the occasion of walking the coastal path, when I used your excellent guide. We got stuck in Orford in the evening as the supposed last bus never materialised (no fault of the guide book!). It was a magical day though – such a unique place. I would love to be a fly on the wall with Macfarlane and Self! Another reason to buy the Big Issue. Thanks for this! Thanks both. 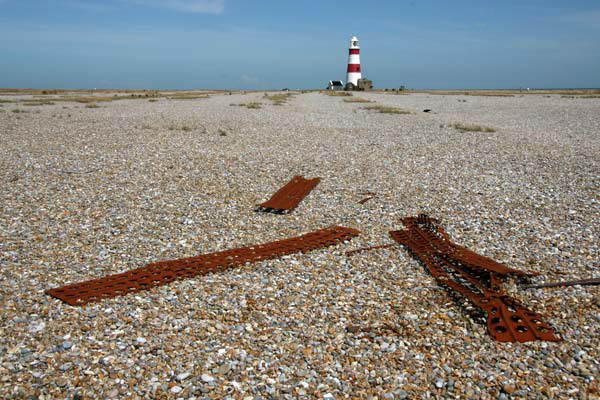 Yes, Orford Ness is a very special place. Diana, according to the Big Issue, Macfarland and Self talked shop all the way – commissions, royalties etc. Sometimes you just need to be alone to appreciate the mood that these places convey (although Macfarlane, at least, seems to know all the right people in all the right places – sailor-poets, artists, writers and so on for walking companions). 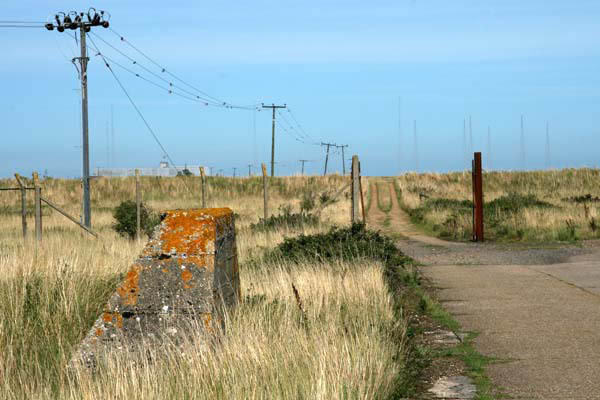 Marvellous post, Laurence, and further enticement to get myself to Orford Ness one of these days. Especially as I’d like to employ the term ‘orfordness’ more often! Many, many years ago the Suffolk coast was one of those places that resonated deeply with me as I wandered the mist-wreathed marshes of Walberswick while geese called invisibly from above. It seemed a place shrouded in secrets, a wonderfully spectral landscape that asked more questions than it answered. I’d just arrived in London before setting out on my own walk last month when I caught a glimpse of Macfarlane and Self on the cover of the Big Issue as I passed a seller. Buying a copy, I carried it with me as I walked through rain and wind before finally getting a chance to read the article one evening in a B&B. Once finished, I left it behind amongst the other magazines for guests in the hopes that it would travel a bit further in the pack of someone else walking the byways and paths of Britain this summer.